Did I tell you I entered four things in the Royal Easter Show this year? No? Here's how my knits went on their big adventure into the glass cases. Ivel Coat - FIRST PRIZE! In category - cardigan or pullover with sleeves in 8 ply or equivalent. We went to the Arts Preview last night, lots of ravellers, lots of fun. If I didn't have such a long drive back I would have partaken somewhat more enthusiastically of the free bar, but not too worry it was a great time anyway. You know what though? I forgot my blinking camera! Duh.. I am not shocked in the slightest that the Ivel coat got first prize, it is just gorgeous. I am surprised the Gloxinaeflora didn't get higher though! Congratulations - you deserve every one of the awards. Your work is beautiful. Congratulations!! All that holidaying really did the trick!! you will be my friend when you are famous non? well done Ailsa, those glass cases are going to look amazing this year. I will be heading straight to the glass cases to have a look. I'm with the others wondering what stupendous creations must've been getting 1st and 2nd prizes. Your knits are sensational. Well done! Your knitting is amazing, and like the other commenter, I'ld love to be able to see the knitting that beat your lace items. Hi Ailsa, all your work is so beautiful and gorgeous!!!! I'm in love with all the shawls you've ever knitted and the cardigan too!! You definitely deserved those prizes!! Congratulations. All stunning knits. Some well deserved recognition. Jussi: Not on your nelly. Tara, RoseRed: The gloxineaflora didn't hold it's blocking (very unfortunate - remember that if you ever go for that Mongolian cobweb cashmere/silk)so it looks really small and like a pile of ramen noodles. But thanks for the vote of confidence anyway! Meagan, Traveller's Yarn, etc: The first and second prizewinners are simply breathtaking work. 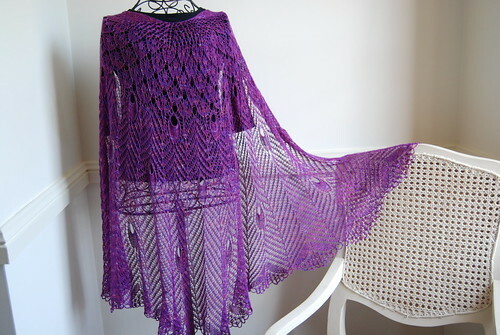 You should see the princess shawl that emasee knitted (won the shetland category - no contest). It makes my gloxi look like a garter stitch scarf. And frillseeker's lyra (won the lace non wool category) is very gorgeous too. 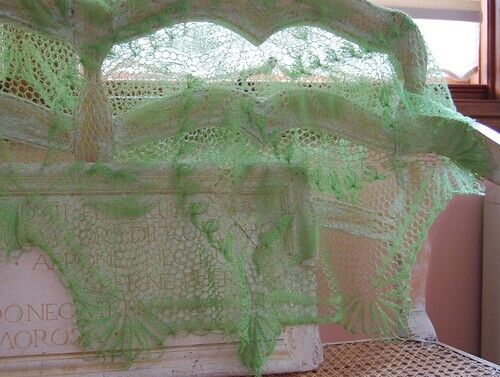 I'm not sure what won the lace wool only category, but all the lace is gorgeous this year. 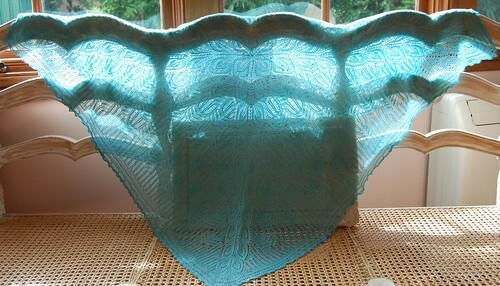 Make sure you check out the Crown Prince Shawl (in the baby shawl category). I don't know who knitted it but I love it. Will you be going back with your camera? I'd love to see some pics seeing I wont be able to go. congratulations, Ailsa - sweep the pool!!! well done!!!!!!! so glad your beautiful jacket won...see it was worth all the $$$ and work! I'd have that in my wardrobe in a flash! we're off to the show tmrw! ohhh I took photos of your lovelies if you want them looking all lovely with their ribbons attached! just email me and I'll send them your way! they looked lovely and stood out!!! Congratulations! All the projects are gorgeous & I really love the coat.